My parents were long time residents of the Flushing area since they immigrated to the United States from Haiti in the early 1980s but have since moved to Springfield Gardens. They would always say that Flushing, particularly Main Street, was very different than it is today. Since I’m only familiar with Main Street as it is now, I wondered what they meant by this and how it contributed to them deciding to relocate to Springfield after living in Flushing for so long. When they lived in Flushing the area consisted of various races and ethnicities with businesses and services to cater to the needs of its respective residents. My dad’s parents contributed to businesses in the area since they owned a tailor shop while my dad worked at a Haitian restaurant. This shows the diversity of businesses and its owners. Something that my parents enjoyed about Main Street was that it “wasn’t too busy but still had everything you need within walking distance”. My parents expressed how the neighborhood started to transition as the Asian population increased and less businesses and services were owned and frequented by other races. 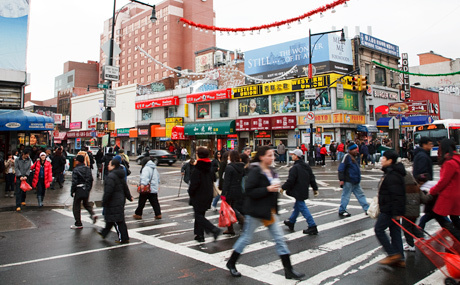 When deciding to stay in Flushing or move to another neighborhood my parents discussed how the dynamic of the neighborhood changed from interactive and diverse to “too crowded with people everywhere and no space”. It was also divided in race, and less interaction among the residents. With overcrowding, the area became a social hub with new developments and businesses, mainly owned by the Asian population and not many services for people of color. This played a factor into my parents deciding to move to another neighborhood because the services they enjoyed were gone and they felt that the area was less integrated than before. This also lead a lot of their friends and family who also lived in Flushing to move away, particularly closer to Long Island. My parents explained that “everyone saw how Flushing changed and was about money and not family”. The neighborhood experienced intimate segregation as the residents coexisted but had no real interaction. This could be attributed to the gentrification of Main Street. As the Asian population increased and the area was transformed to include more amenities the area became more segregated and crowded. The area is more urban and less concerned with creating a suburban environment. It instead creates luxury apartments and shopping centers that were not suitable for my parents who had just started a family which also prompted their decision to move. In comparison, my parents decided to live in Springfield Gardens because it has amenities suited to their needs without the overcrowding and confined spaces they began to see in Flushing. There is also more diversity and interaction between residents. Since moving to Springfield Gardens, gentrification has not occurred as greatly as it did in Flushing. There has been minimal changes in the area but overall it has not seen large increases in population and within their 20 years living in the area, my parents noticed that “we are still friends with the same people in the neighborhood for so many years and it has not changed too much in that time”. It was interesting to see how Flushing gentrified overtime while Springfield Gardens has remained the same throughout the years. Through this discussion with my parents I was able to learn more about the dynamic of Main Street from the 1980s, when my parents first moved to the area, to 1997 when they moved to Springfield Gardens. From the interview I was also able to apply what I’ve learned about gentrification and its connection to housing. I was able to better understand how gentrification affects people’s feelings towards the area and why they feel the need to displace themselves. I think you made a very interesting observation. Most of the time we see gentrification as “white” issue, with only white people coming into the area and prices sky rocket, but you mentioned another group, which I had never thought about. There is a whole other level of segregation in Flushing. It has seemed that they have segregated themselves, because anytime you walk through Flushing most businesses and shops are asian, therefore most of them serve asian needs and services, food and markets especially. This does cause some feeling of “not belonging” and can cause intimate segregation for those none asian living in the area. I never seen Flushing at gentrified before. I had always lived in whitestone close to flushing and from what I remembered it was always an Asian population there. When I think of gentrification I think of wealthier groups of people moving in and changing the neighborhood. I have noticed in flushing as well that it is more money than family ad I understand why your family moved away. I feel the segregation in flushing too.